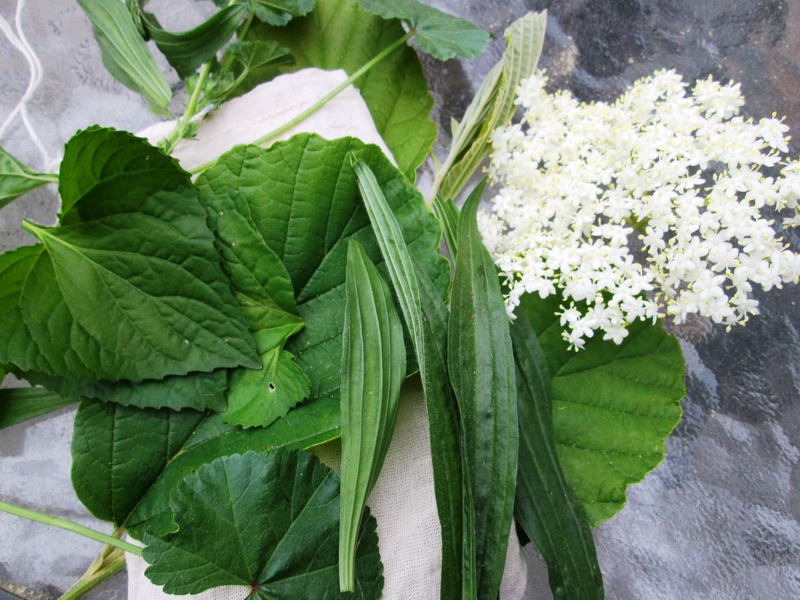 Yesterday my friend Shelley asked about using valerian flowers rather than root. This is something I've been doing for years because the root tincture makes me jittery instead of relaxed. 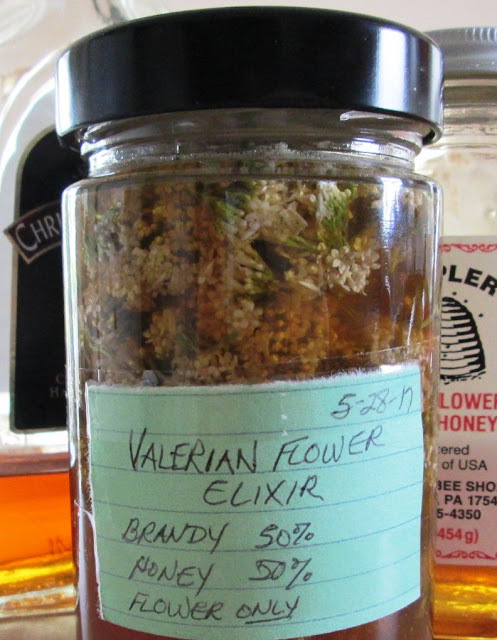 I've always done a tincture, but Susan Hess from The Stillroom at Pitch Pines (formerly Farm at Coventry) mentioned that she has been making an elixir with the flowers, and loves it. Others said that they found the flowers more relaxing than the root (plus the root is hard to dig and clean). Having all the ingredients, this morning was a perfect time to try this out, and I used the instructions that Sue generously provided. Depending on the herb, sometimes you use more or less honey... a different alcohol... but this is what Sue suggested and oddly enough, I actually followed a recipe for once. 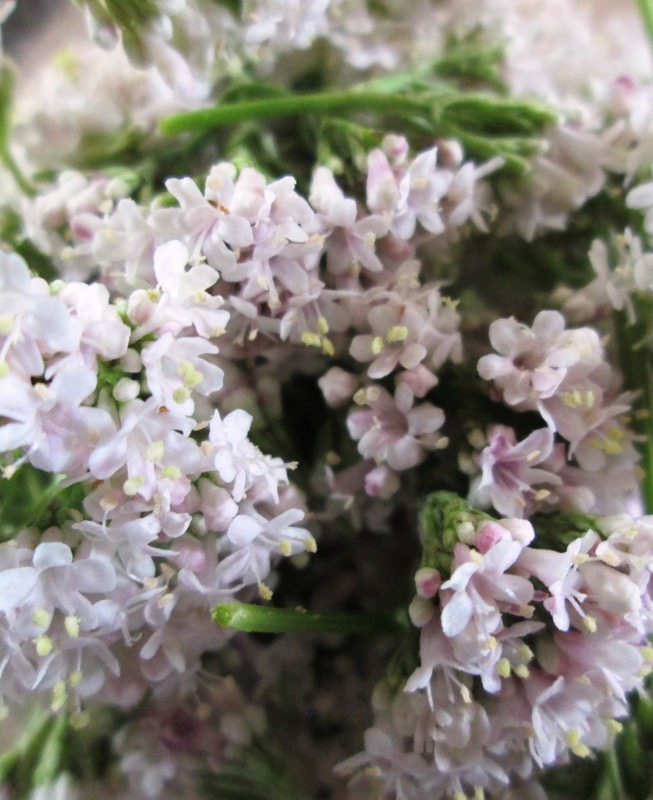 #1 Fill a jar with valerian blossoms. 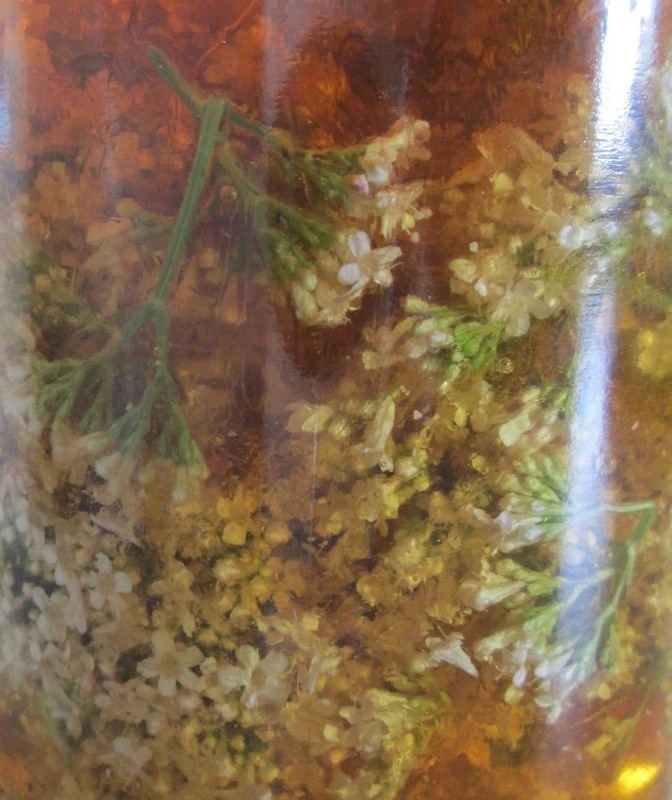 #3 Work the honey around with the blossoms so they're all covered. #4 Fill jar to the top with brandy. #5 Mix well to get any air pockets out, and top with brandy again if needed. #7 Shake mixture every day or so for a month. #8 You can either leave it as is until you need it, or strain and bottle. Tomorrow I think it will be lemon balm. In the meantime, I'm gathering cleavers seeds for another friend. This time of year is a lot of fun! 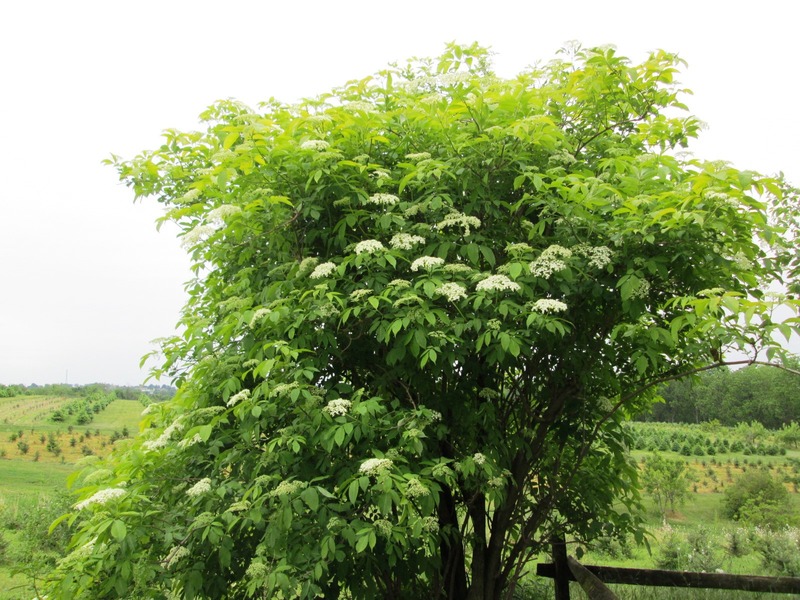 There are many ways to enjoy elderflowers. Standing by the tree and enjoying the scent is one of them. Looking closely at their beauty, and brushing their softness against your cheek is another. Bringing them inside, you can find so many ways to love this gentle, healing flower. Elderflower has traditionally been used in skin preparations. It can also kick a cold to the curb. Just the blossoms steeped in water with a little honey is delicious, but even better to snip a few leaves of mint or anise hyssop to add their flavors. Check out the blog post for full instructions from Marita Orr. Fine pink Himalayan salt is nice to use, but any sea salt works. Table salt works too, but the added minerals in sea salt are nice for your skin. To the salt, mix one part (by volume) botanicals with ten parts salt. Add a squirt of lemon juice to keep flowers from browning. If you have a good blender, grind the salt, flowers, and lemon juice together. Spread the mixture on a sheet of parchment overnight to dry. Use about equal parts of salt mixture and an oil. Olive oil is fine, or you can choose something like sweet almond or apricot kernal for a lighter color and feel. If you'd like to add a scent to this, include no more than 10 drops per ounce. 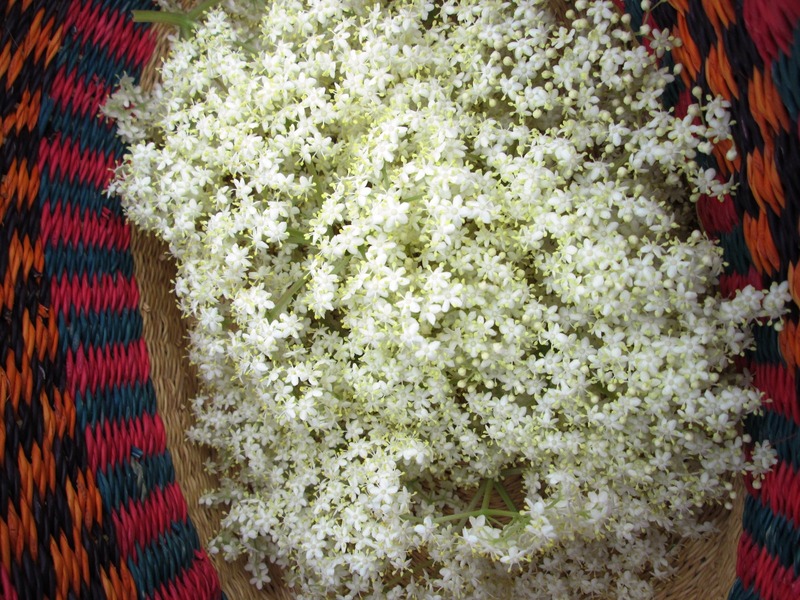 Fill a pint jar loosely with elderflowers. Pour in 1/2 cup sugar. Cover with alcohol (I use 150 proof vodka). Allow to sit and meld together for several weeks, shaking occasionally. After about a month, taste it and see if it is sweet enough. If not, add a little more sugar, shake, and allow to rest for another week or two. Strain, bottle, and label. Drink on a fine midsummer night. 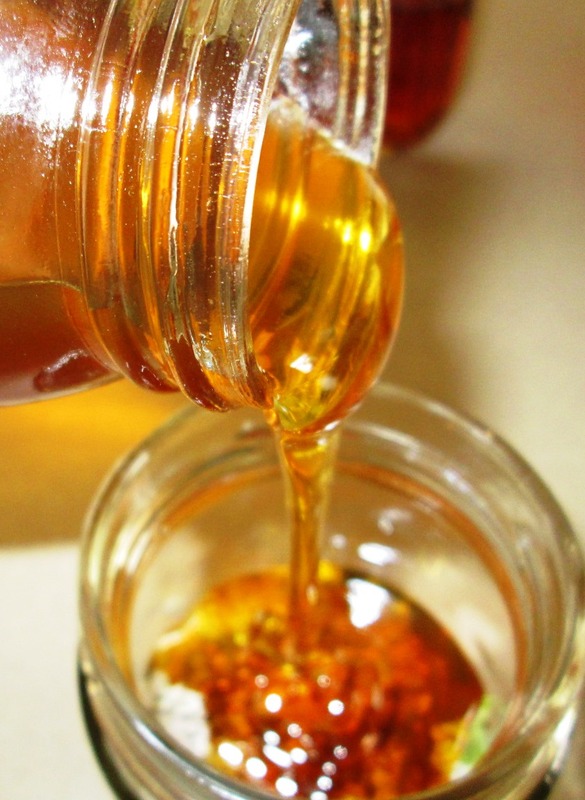 Add honey instead of sugar for an elixir, and skip any sweetener for a tincture. 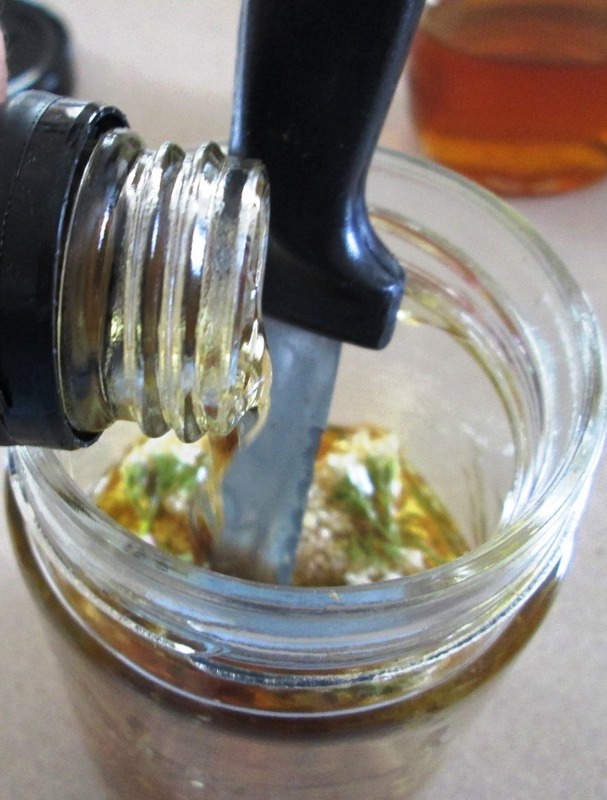 You can infuse this oil all at one time by gathering corresponding amounts of herbs, wilting them, and then heating gently in about a cup and a quarter of oil. Heat together about 1/4 of the oil with the beeswax until the wax melts. Add the rest of the oil and continue to heat until everything is liquid. Pour into jars and label. 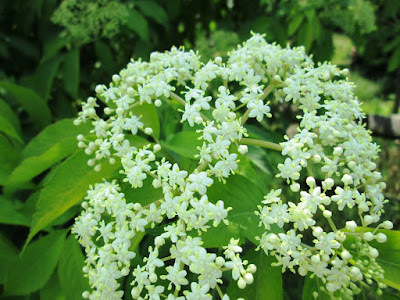 Boil the elderflowers in the water, cover and simmer for ten minutes. 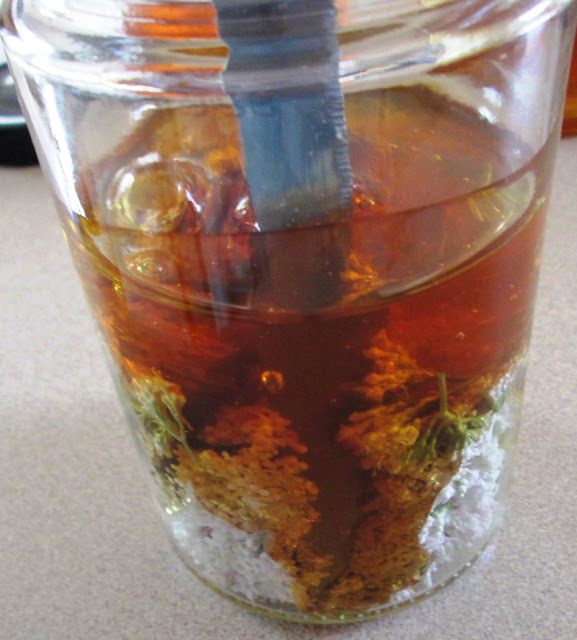 Remove from the heat and infuse for an hour. Strain and add the cider vinegar. Bottle. Leave for 48 hours before use. After washing your hair use a cup of the rinse on the hair. Right now, any of these can be found in my yard, and they all make a wonderful soothing bath tea. Gather a large handful of those you'd enjoy using - or those that are in your vicinity. If you have a big muslin bag, fill it with the botanicals. Otherwise, a tea towel will work. Place the botanicals in the middle, and leaving plenty of space for the leaves and flowers to swim around, rubberband or tie them inside the towel. Steep them for at least 15 minutes in a large pan of boiled water. Add that water to a drawn bath, and hop in. Snip umbels of open blossoms, leaving them whole. Make a thin pancake batter, adding a pinch of freshly grated nutmeg and some lemon zest. Dip the umbels into the batter using the stem as a handle. Place into the pan and fry until golden brown. Bonus points if you made violet syrup to drizzle on top. 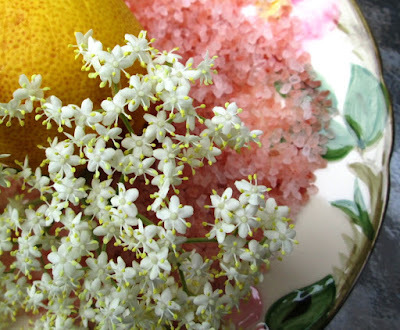 OR follow those directions substituting elderflowers for violets, and make elderflower syrup! That's closer to a dozen - but you can never love them too much! Be sure to dry any flowers you don't use. They can be added to teas or face washes. Most of my blog entries come about because there is either something I don't want to think about, or something else I am avoiding doing. This is true again on both counts today. So today we make tea! First up is a tea made from a walk in the yard. There are several good, tasty options out there right now. Some I didn't choose would be nettles, sage, mint, and pine or fir tips. I had a plan, see? First stop was the row of black raspberries. They're starting to form tiny berries. They must have blossomed last week when we were busy with other things. Then the *just* opened-this-very-day-for-the-first-time elder blossoms grabbed me firmly by the nose and dragged me over their way to choose one perfect umbel. I made my way to the lemon balm and picked a few sprigs. You may not see that area, though. It's hard to find the lemon balm through the weeds. Beside that, there were beautiful leaves from black currant and gooseberry. On the far end of the yard, the lush and succulent blueberry leaves called. Headed towards the door, I grabbed two little sprigs of anise hyssop. All of it went into the French press. While it steeped, I put some lemon and blueberries into a quart mason jar. In the meantime, I chopped the rest of the lemon and put it into the big gallon refrigerator jar, and put more water on to heat. A muslin bag was filled loosely with some flavored green tea. 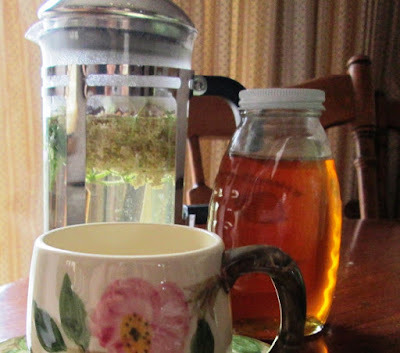 We've been making gallons of tea a couple times a week this spring, and it is so nice to have it handy and cold. The Backyard Berry Tea was overtaken by the anise hyssop, but in a very pleasant way. It will develop overnight in the fridge, and tomorrow Molly will love it!